Ever since Worf had his first taste of command way back in TNG Season Two, it was a foregone conclusion that he would become a ranking officer at some point in his career. After transferring to Deep Space 9, we saw him gradually assuming more responsibility, culminating in his command of the Defiant at the second Borg invasion of Sector 001. As the Defiant was specifically designed to combat the Borg threat, Worf's aggressive command style allowed the ship to survive the Queen's onslaught. Having seen the effects of assimilation first hand, Worf knew he had but one option when the Defiant's primary weapons were depleted. The release of the TNG Defiant in last year's Face of the Enemy expansion led many to expect a TNG Worf as a corresponding Commander. When it came to our Star Trek 50 entry for First Contact, my instincts obliged those expectations, and I pitched a new Defiant Commander: TNG Worf. He cost 4, had four skills, and initially his ability was a little more proactive: "Destroy your staffed ship this personnel is aboard with two or more Damage cards on it to place all those Damage cards on an opponent's ship at a non-headquarters mission." Our playtesters quickly pointed out that this could be used offensively with Exceed Engine Output, and that would constitute a viable option for a back-door TNG ship destruction deck with cheap sacrificial options like U.S.S. Bozeman or I.K.S. Qel'poh. Since that's not the flavor we wanted in a set that was supposed to celebrate heroics, we tweaked his ability to its current form. While it doesn't allow you to set up a sneak attack as easily, it does provide a decent deterrent against a one-turn multi-ship strike force, and lets you take one of them with you. 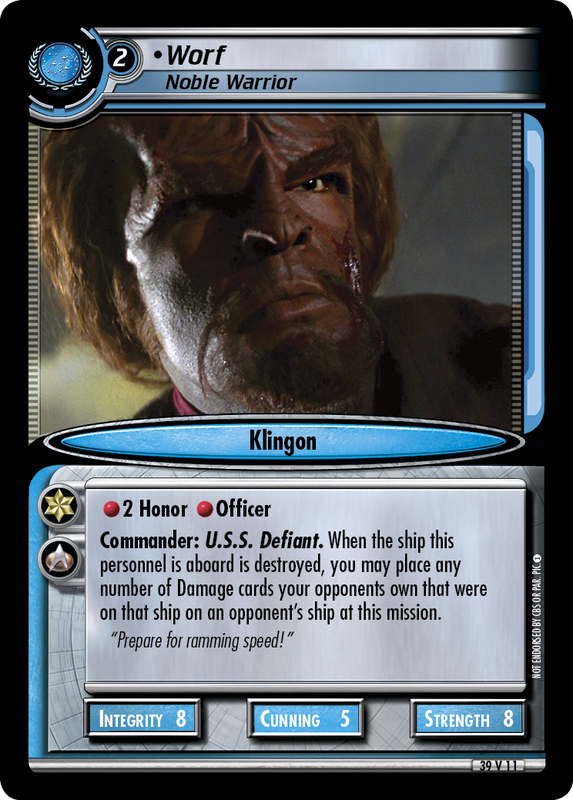 The last adjustment for Worf was to pare his cost down to match up gameplay-wise with the other personnel in the set. This meant he lost all his skills except for 2 Honor and Officer, which we felt were part of his core identity. After Charlie's so-called "aggressive rounding", Worf's cost came down to 2, and we ended up with a niche ability on a solid yet inexpensive personnel that could slot in quite nicely in existing TNG or Defiant Commander decks. I do have one request for those of you brave enough to try this personnel out. If you do end up using his ability, please PM me a picture of the opponent's ship with three Damage cards on it with Worf floating in space nearby. Cheers!